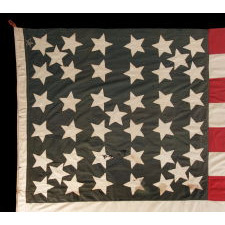 Flag Size (H x L): 78" x 121.5"
Numerous flags appeared with unofficial star counts in early America, produced by flag-makers in anticipation of the addition of more states. The 41 star flag is one such example. 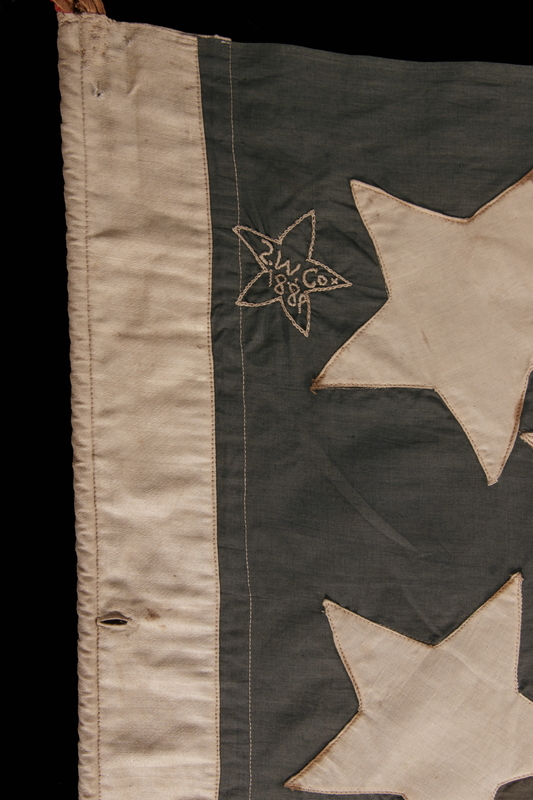 Just a tiny handful flags in this star count are known and they are among the most rare of the 19th century. To understand why, one may turn back the clock to 1867 and examine flag production from that year until the addition of the 44th state, in 1890. After the Flag Act of 1818, the official “flag year” began every July 4th. So on Independence Day, all states having been added to the Union over the previous year were officially given a star. Makers of flags, however, did not wait for July 4th and official star counts. 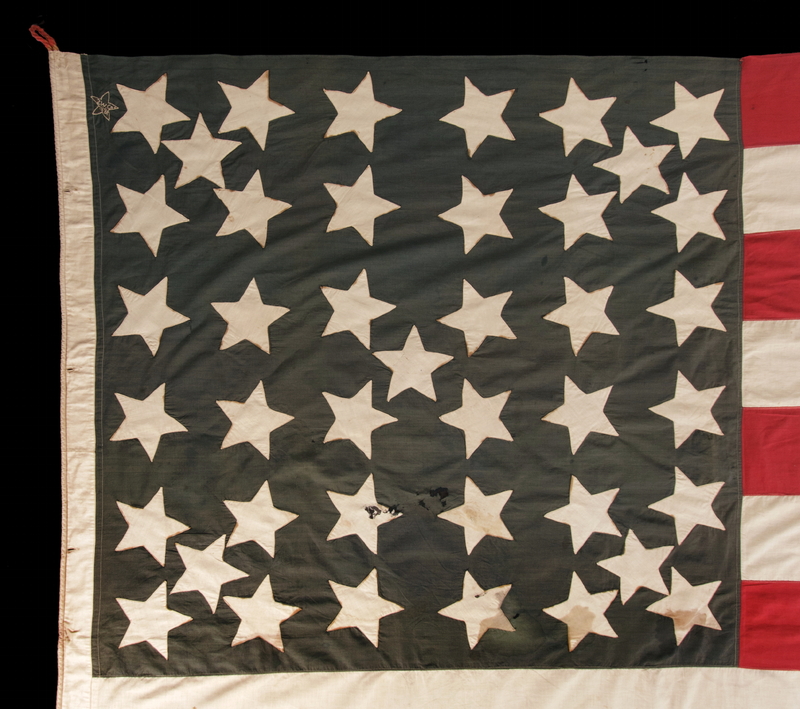 Flag-making was a competitive industry and many manufacturers added stars before new states were actually added, creating incentive for consumers to buy new flags and increase sales. 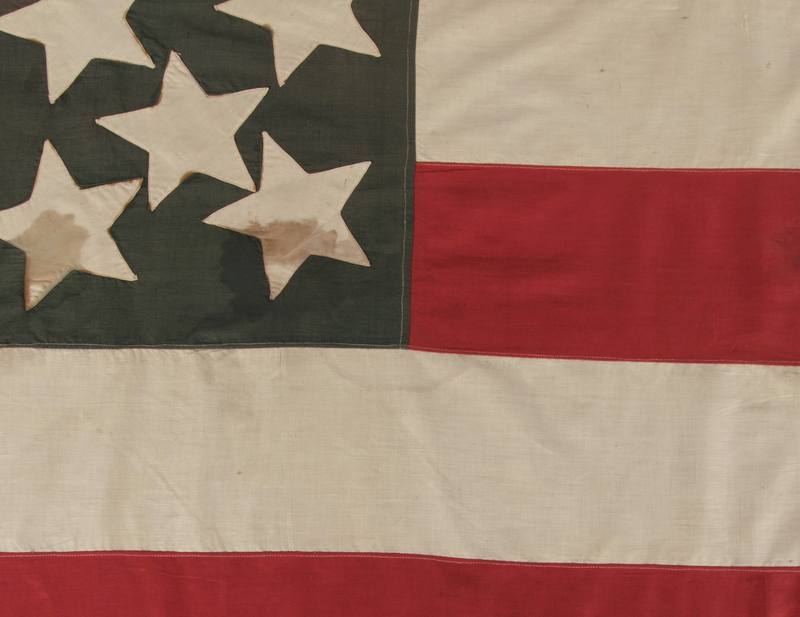 In 1876, the 37 star flag was official, but on August 1st we received our 38th state. 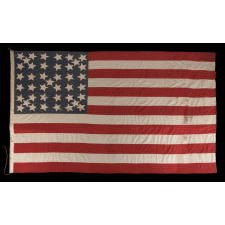 Many flag-makers abandoned the 37 star flag when production began for the Centennial International Exposition, a six-month long World's Fair, held that year in Philadelphia, as the first of event of its kind on American soil. This served as the nucleus for celebrations of our 100-year anniversary of independence from Britain. In that year, 38 stars was a common choice, but other flag-makers actually skipped past 38 all-together, choosing to instead produce 39 star flags, anticipating the addition of the Dakota Territory as one state. Seeing that Dakota wasn't coming, production after 1876 seems to have reverted to the 38 star count. 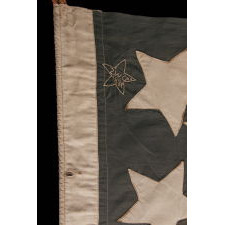 Then, in 1889, thirteen years later, 39 star flags were once again manufactured with the anticipation of Dakota's statehood. On November 2nd of that year, a surprise lay in store for the makers of 39 star flags, when the Dakotas arrived as two separate states, forever rendering 39 star flags both inaccurate and unofficial. Just a few days later, on November 8th, Montana entered the Union as the 41st state, followed by Washington State as number 42 on November 11th, just 3 days hence. 40 star flags were made in limited quantity, reflecting the Dakotas’ entry. This count is very scarce, but not exceptionally rare. Perhaps this is because some flag-makers anticipated the number correctly. 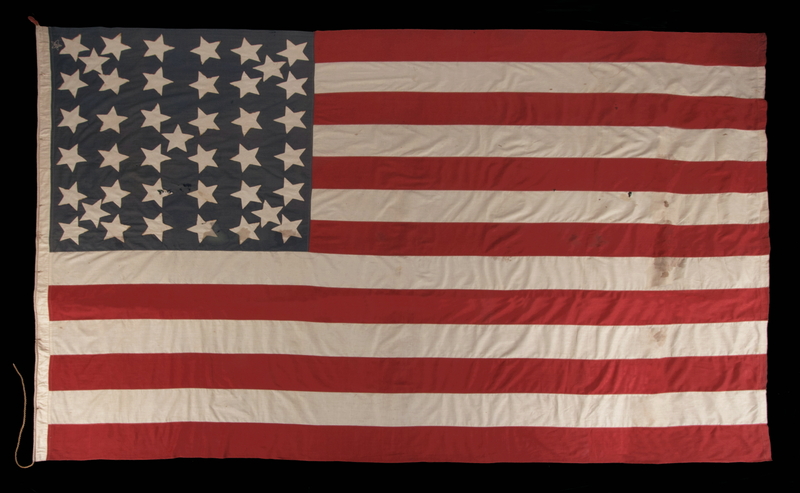 41 star flags, by contrast, are among the rarest that exist in 19th century America. Accurate for just 3 days, an increase ending in a count of 41 seems to not have been predicted. By stark contrast, flags with the 42 star count are common. These reflect the four new states that arrived in that week-and-a-half period between November 2nd - 11th. For the next seven to eight months, flag-makers seem to have favored this star count, producing many of them, especially with regard to printed flags, probably with great enthusiasm and with fairly good reason. At this point in American history, 13 years was a very long time with no new states. Then, on July, 3rd, 1890, just one day before the 42 star flag would have become official, Idaho snuck in as the 43rd state. This rendered the 42 star flag forever unofficial. The following day, the count of stars on the American national flag was officially increased to 43. In spite of this fact, flag-makers basically skipped past the 43 star flag entirely, because on July 10th, just 7 days later, Wyoming was admitted. Practically all flag-makers seem to have predicted this and 43 star flags, while official for one year, were overlooked in favor of those with a count of 44 to include Wyoming as well. Even though the windows in which some of these stars counts were accurate are small, celebrations would have taken place in the respective states, upon their addition. Related festivities would also have been held in the nation’s capital, and potentially elsewhere throughout America. In other words, while some 41 star flags may have been produced in anticipation of Montana's addition, others may have been made expressly for these events held at the actual time of its entry. Whatever the purpose, 41 star flags are among the most rare that exist in all of flag collecting. Within the category of printed parade flags (a.k.a. hand-wavers), there is but one known style. Printed on cotton and surviving in two different sizes, a small collection of these are known. In the larger size, measuring about 24 inches in length, perhaps 15-20 are known, while within the smaller version, there is but one known example. Within the category of pieced-and-sewn flags, meaning those have individually stitched stripes and either appliquéd, embroidered, or painted stars, the scarcity is far greater. Just two examples are presently known to exist. One is in the collection of Peter Keim and is illustrated in his book "A Grand Old Flag" (DK Publishing, New York, 2007) on pages 147-148. I had the privilege to buy and sell this years ago. The other is the flag that is the subject of this narrative. Both measure approximately 10 feet on the fly and are this regard typical of the period. 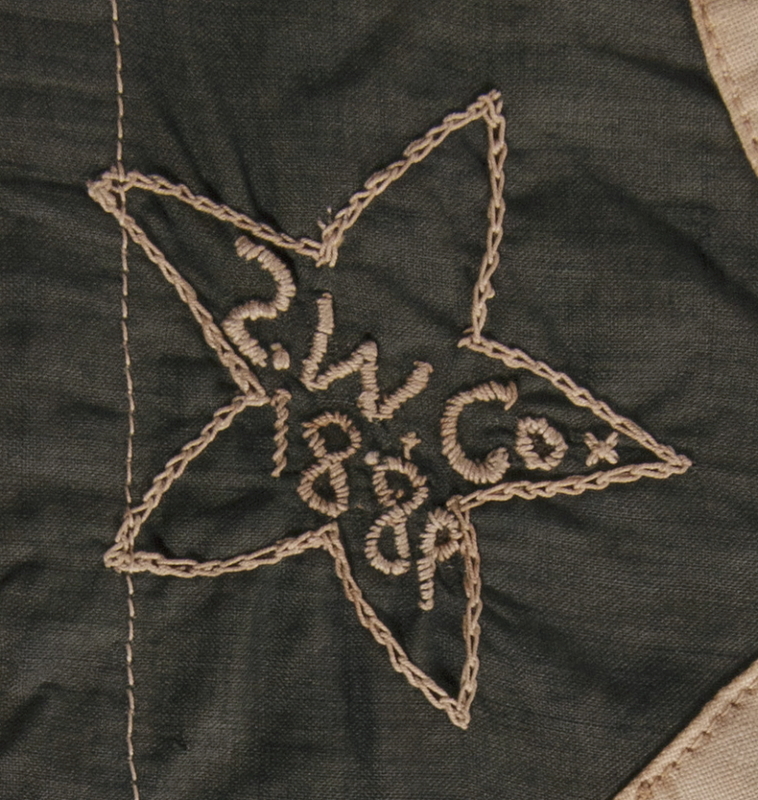 The stars of the flag in question here are made of plain weave cotton and are double-appliquéd (sewn to both sides) with treadle stitching. These are presented in an interesting lineal pattern of 36, within which 5 additional stars were placed in off-set positions. These create 5 individual cross-hatch patterns, including one in the center and one in each corner of the configuration. While one might expect to discover a flag where these oddly placed stars were added at a later date, update a pre-existing star count, these are plainly part of the original construction. The canton and the white stripes of the flag are made of plain weave cotton, while the red stripes were pieced from a red cotton twill. These were joined with treadle stitching. There is a wide, polished cotton header along the hoist, applied in such a way as to create an open sleeve, through which a braided hemp rope was passed, looped at the top, and stitched into position. The rope is of the wool-wrapped variety (red wool in this case) common to military flags and was probably re-purposed. In addition to the rope, 6 neatly-stitched, button hole grommets were created along the hoist, so that the flag could be tied, if needed, to a staff. This is a wonderful addition, though because the flag is so long, it could not be hand carried. It may have instead served so that the flag could be hung vertically from a building or across an open expanse, such as a street. 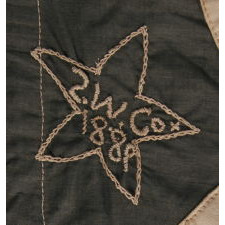 In the upper, hoist-end corner of the canton, a star-shaped emblem, containing a signature and date, was hand-embroidered. The first character is either an "S" (possibly backwards-facing), or a "2," or a "Z," followed by "W. Co.," followed by "1889." This almost certainly identifies a business as the owner, though after extensive searching I cannot locate an obvious match. The notation is simply too brief and too generic. Whatever the case may be, the inclusion of the needlework is both a beautiful and wonderful addition. On one hand, it serves to document the flag to the precise year in which it was expected to have been made and used, coinciding with the addition of Montana. And while the star-shaped profile might simply denote that the owner was patriotic, it may likewise reflect the anticipated transition of yet another Western Territory to statehood. All-in-all, one of the best and most rare pieced-and-sewn flags that a collector could ever wish to acquire. Condition: The overall condition is remarkable for the period. There is very minor foxing and staining throughout, and overall minor oxidation. There is modest to moderate soiling in a few of the stars, accompanied by modest to moderate areas between the 4th and 10th stripes, toward the fly end. There is a series of minor holes in the lower center of the canton, and there are very minor holes in 3rd, 5th, and 6th stripes. The canton has faded some to achieve this blue-grey hue, and there is a modest area of color loss adjacent to the 3rd star from the fly end, in the bottom row. 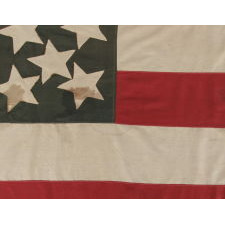 A tiny patch was added in the extreme, fly-end corner of the top stripe, where the flag experienced minor loss. Many of my clients prefer early flags to show their age and history of use. Further, the extreme rarity, as one of just two known pieced-and-sewn examples in this star count, would warrant practically any condition.